^ "Fact Sheets: North American T-39A Sabre Liner Archived 2010年10月6日, at the Wayback Machine.." National Museum of the United States Air Force. ^ "Rockwell Sabreliner. 56 hull-loss occurrences, last updated 5 May 2007." Aviation Safety Network. ^ Jeremy R. C. Cox, St Louis Air and Space Museum. St. Louis Aviation. ^ Air International July 1976, pp. 8–9. ^ Air International July 1976, pp. 9–10. ^ Air International July 1976, p. 10. ^ Air International July 1976, pp. 10, 12. ^ Casey, Aloysius G.; Casey, Patrick A. (2007). Velocity : speed with direction : the professional career of Gen Jerome F. O'Malley. Maxwell Air Force Base, AL: Air University Press. pp. 247–253. ISBN 978-1585661695. ^ National Museum of the United States Air Force Presidential Gallery Archived 2007年1月18日, at the Wayback Machine. "The Stylish Sabreliner". Air International, Volume 11, No. 1, July 1976. pp. 7–14, 36–39. 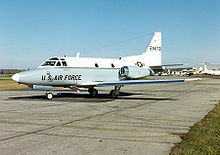 T-39 / CT-39 Sabreliner. GlobalSecurity.org.